Ghe-O Motors represents the place where the pure philosophy of racing and driving experience comes to life in the best possible way. Uninfluenced by strictly commercial considerations or constraints of fashion, we are free to imagine vehicles that will take your imagination to the edge. Here the competition is the true testing ground for next generation of vehicles. For best results, we use the best in class components and space age materials even if they are recommended for planes or performance track cars. This will always give us a great advantage over the regular commercial vehicles. Besides the great customer satisfaction, our main challenge is to offer products with a reasonable pricing despite the semi industrial and exotic materials we use. Our extreme off-road cars are pilot tailored and can meet any demands regarding components and chassis. A utility vehicle is very different from what you would expected. Born from the race environment, a truck size utility is in fact a lightweight extreme machine with no match in the field. It is almost impossible to put in words all the qualities of these cars. This is why we made some footage to give you a hint about what these cars are capable of. We hope you will enjoy it. 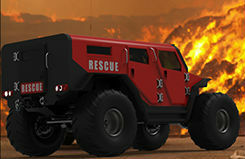 RESCUE is an off-road extreme solution for saving up to eleven persons, extinguish a fire, provide medical support (many medical accessories like a special place for stretcher, etc). 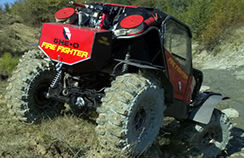 FIREFIGHTER represents the ideal command and control on-site solution, for access in the most demanding and extreme off-road environment. MOTORSPORT -EXTREME CLASS needs the most extreme building solutions, we have all custom-made solutions for building your extreme off-road experience. 5-6 Aprilie, Piata Constitutiei, Bucuresti.